Get dinner on the table in no time with this simple and delicious time-saving meal! 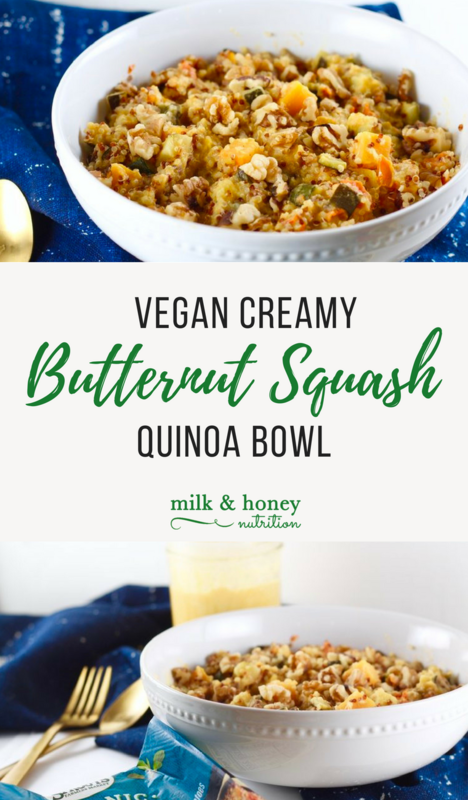 The Vegan Creamy Butternut Squash Quinoa Bowl will be ready in under 20 minutes, and it's loaded with fiber and plant-based protein! This recipe was sponsored by Sprouts Farmers Market. All thoughts and ideas are my own. Add the onion, garlic, and avocado oil to a sauté pan and let them heat on medium high heat on the stove for 5-10 minutes or until the onions start to turn translucent. Meanwhile, steam the butternut squash in the microwave until soft (follow the package instructions). Add the sautéed onion and garlic, steamed butternut squash (with liquid drained), coconut cream, salt, and pepper to a blender. Blend on high for 60 seconds. Next, steam the Sprouts Ancient Grain Blend in the microwave as directed on the package. Add the quinoa mixture to a large bowl and top with 1/2 cup of the butternut squash sauce (save the rest for another time). Sprinkle with the chopped walnuts and enjoy!